The Funky Finds Holiday Shopping Experience was a success! And, as always, it flew by in a flash! Over the next few weeks, I will be highlighting some of the fabulously funky artisans that participated in the event. In the meantime, I wanted to provide a charity report from the event. Ten dogs were adopted at the event which allowed The Humane Society of North Texas to raise $600.00 ($60 per dog). Attendees also gave cash contributions totaling $237.00. The charitable raffle raised $1,504.00. We split that money evenly between HSNT and Toys For Tots. Toys For Tots & donated $360.00 in cash! 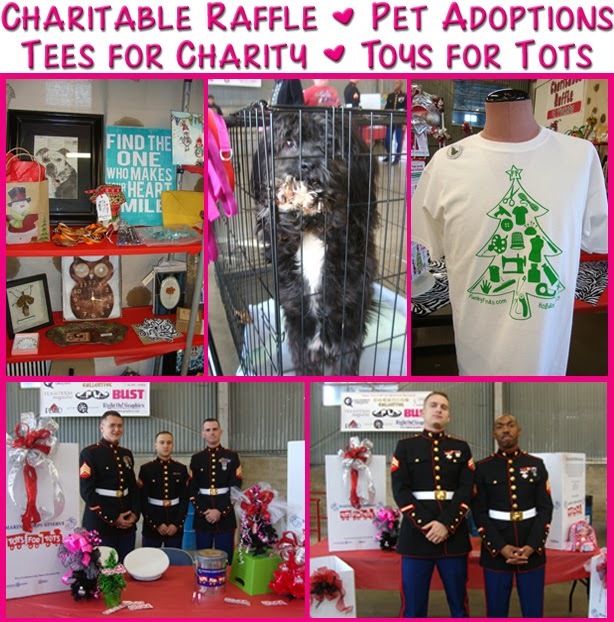 We raised an additional $618.00 through event tee sales at the event for HSNT! Many thanks to event sponsor Quackerbox Creations, Ltd. for donating the shirts & printing at cost. This was the first Funky Finds event in which Cowtown Loves Animal Shelter Pets (CLASP) participated. We allowed them to set up at the event & sell some of the hand-crafted items made by volunteers & they raised $623.00 for their organization! Don't Forget to Feed Me was another charitable organization at the event & they collected 250 pounds of pet food & raised $1,100.00. All in all that is $5,042.00 raised for local charities! Thanks to all who donated raffle prizes, swag items, bought raffle tickets & donated to these terrific groups.